Proliferative Diabetic Retinopathy (PDR) is the leading cause of vision loss in patients with diabetes mellitus. Untreated, almost 50% of patients with high-risk PDR experience severe vision loss in 5 years 1. The standard treatment for PDR has been Panphotocoagulation (PPC), ever since the “Diabetic Retinopathy Study” demonstrated its benefit almost 40 years ago 1 (Figure 1). PPC can be performed in a single session (1,200-1,600 impacts) or various sessions in 1 month or month and a half (sessions of 300-500 impacts). DMO appears only in 3% of eyes with mild non-proliferative retinopathy, increases to 38% in those eyes with moderate to severe non-proliferative retinopathy and rises to 75% in those eyes with proliferative retinopathy 6. 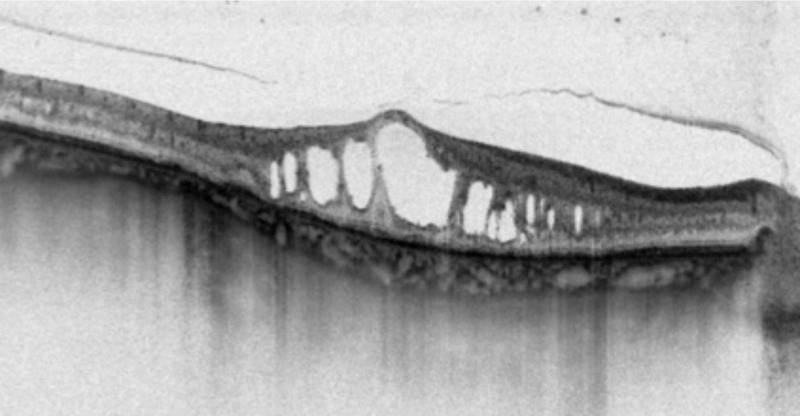 Retinography (left, figure 1) of a patient with Proliferative Diabetic Retinopathy (PDR) treated with panphotogoagulation (PPC). Retinography in colour (center, figure2) and autofluorescence (right, figure 3) of a patient with PDR treated with PPC. At the present time, the drugs approved for the treatment of DMO are; Ranibizumab (Lucentis®; Novartis, Basel, Switzerland and Genentech Inc., South San Francisco, CA), Aflibercept (Eylea®, Bayer, Regeneron, NY, USA), the prolonged release implant of dexamethasone (Ozurdex® Allergan, Inc, Irvine, CA, USA) and the intravitreal implant of fluocinolone (ILUVIEN®, Alimera Sciences, Alpharetta, GA), the latter restricted in patients with chronic DMO refractory to other treatments. It has been published that intravitreal injections of anti-VEGF, used as a treatment for DMO, reduce the risk that diabetic retinopathy will worsen and increase the chances of improvement 7-9... This makes it a treatment that is potentially viable for PDR. Recently, the American diabetic retinopathy clinical research network (DRCR.net) published a randomised clinical trial to assess the non-inferiority of intravitreal injections of Ranibizumab in comparison with PPC in terms of visual acuity in patients with PDR 10. They conclude from the study that of all the eyes with PDR, visual acuity at 2 years in the patients treated with Ranibizumab was no less than the visual acuity in patients treated with PPC. However, lengthier monitoring is required. In summary, PPC continues to be the standard treatment for PDR, and in the cases in which DMO is associated, it is necessary to treat the MO, either with a focal laser or with intravitreal injections (anti-VEGF or dexamethasone implant), as indicated. But it is important to take into account the recent results published by DRCR.net. Time, and particularly the new clinical trials, will define and consolidate the potential use of antiangiogenics in managing PDR without associated DMO. Figure 4. Retinography of a patient with PDR, treated some time ago with panphotocoagulation, in which angiography demonstrates the persistence of active NV. Figure 5. The OCT confirms the presence of cystoid macular oedema. 1. Diabetic Retinopathy Study Research Group. Photocoagulation treatment of proliferative diabetic retinopathy: clinical application of Diabetic Retinopathy Study (DRS) ndings, DRS report number 8. Ophthalmology. 1981;88(7):583-600. 2. Rezaei KA, Stone TW, eds. Global Trends in Retina Survey. Chicago, IL: American Society of Retina Specialists; 2014. 3. Early Treatment Diabetic Retinopathy Study Research Group. Photocoagulation for diabetic macular edema: EARLY Treatment Diabetic Retinopathy Study report number 1. Arch Ophthalmol. 1985;103(12):1796-1806. 4. Brucker AJ, Qin H, Antoszyk AN, et al; Diabetic Retinopathy Clinical Research Network. Observational study of the development of diabetic macular edema following panretinal (scatter) photocoagulation given in 1 or 4 sittings. Arch Ophthalmol. 2009;127(2):132-140. 5. Googe J, Brucker AJ, Bressler NM, et al; Diabetic Retinopathy Clinical Research Network. Randomized trial evaluating shortterm effects of intravitreal ranibizumab or triamcinolone acetonide on macular edema after focal/grid laser for diabetic macular edema in eyes also receiving panretinal photocoagulation. Retina. 2011;31(6):1009 1027. 6. Klein R. The Wisconsin Epidemiologic Study of Diabetic Retinopathy IV. 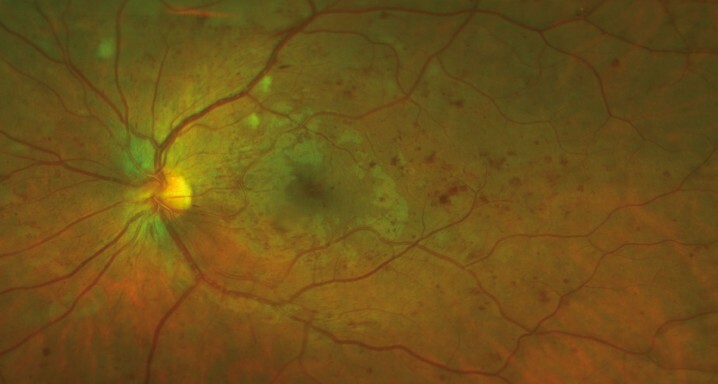 Diabetic macular oedema. Ophthamology 1984;91:1464-1474. 7. Elman MJ, Aiello LP, Beck RW, et al; Diabetic Retinopathy Clinical Research Network. Randomized trial evaluating ranibizumab plus prompt or deferred laser or triamcinolone plus prompt laser for diabetic macular edema. Ophthalmology. 2010;117(6):1064-1077.e35. 8. Korobelnik JF, Do DV, Schmidt-Erfurth U, et al. Intravitreal a ibercept for diabetic macular edema. Ophthalmology. 2014;121(11):2247-2254. 9. Ip MS, Domalpally A, Hopkins JJ, Wong P, Ehrlich JS. Longterm effects of ranibizumab on diabetic retinopathy severity and progression. Arch Ophthalmol. 2012;130(9):1145-1152. 10. Writing Committee for the Diabetic Retinopathy Clinical Research Network. Panretinal Photocoagulation vs Intravitreous Ranibizumab for Proliferative Diabetic Retinopathy: A Randomized Clinical Trial. JAMA 2015;314(20):2137-46.